I congratulate John Key for his courage not to hide his intent to sell 49% of our assets, I salute him for having the courage to stand by his political convictions and demand a debate on the issue, because a debate is what he will get. What I would like to hear is the rest of it now thanks. What other assets will you reclassify as not assets so that technically you can claim - "Hey, I said we would sell assets, but they aren't classified as assets after I reclassified them and if you'll agree to this colossal theft of your public assets, you won't squirm too much when I sell TVNZ, Quotable Value and VTNZ". And what about this investment you intend to make from this privatization? Into more irrigation in the South Island? You more mean infrastructure investment into Dairy who continue to steal and pollute our diminishing water resources in the South Island? That's what we are selling our assets off for? South Island Dairy Industry interests? Shouldn't you be a little more honest? Surely allowing Bill English to have a dirty lignite production facility in his own electorate to power his Brother's Federated Farmer's industry cheaply was payment enough for services to be rendered? Why on earth are we finding a monopoly who benefit from our collective pristine environment yet do some of the worst pollution damage, even more corporate welfare while social services are slashed? Would you find it palatable then if the proceeds from any partial sale of State Assets went to funding upgrading of infrastructure in Auckland such as the proposed Public Transport projects? Keep the assets, and have a discussion about how best to run them efficiently, and tax capital gains of poperty speculators to pay for social infrastructure. Easy when you think about it. Trouble is that would meet the needs of the vast majority and not the tiny jminority of parasites. "China has a national economic strategy designed to make it, and its people, the economic powerhouse of the future. They’re intent on learning as much as they can from us and then going beyond us (as they already are in solar and electric-battery technologies). They’re pouring money into basic research and education at all levels. In the last 12 years they’ve built twenty universities, each designed to be the equivalent of MIT." "we have global corporations that happen to be headquartered here. Their goal is to maximize profits, wherever they can make the most money"
"the prosperity of America’s big businesses has become disconnected from the prosperity of most Americans." The Corporatocracy does not benefit society or the environment. It benefits those who can afford to own shares. And average Americans suffer, cities decay and go bankrupt. And this is the model we want to take our lead from? Dave - property speculators/developers/traders are taxed already. Sorry - everyone should be allowed to have 1one property - house..family home...family farm. Any property over and above that should be subject to capital gains tax on sale. Seems fair enough to me. "Would you find it palatable then if the proceeds from any partial sale of State Assets went to funding upgrading of infrastructure in Auckland such as the proposed Public Transport projects?" Would you find it palatable then if the proceeds from any partial sale of State Assets went to funding the tax cuts for the rich over the next couple of years. Again, my answer would be no...and that IS the question. Not sure what train tracks and traffic jams have to do with selling off public assets...but nice try. 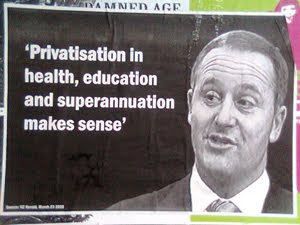 I can't wait for the Asset Sale Elections to happen, bring it on, bye bye John Key! The thought of Kai Tahu & other Iwi Runanga possibly owning a large portion of our electricity companies makes me feel very comfortable. They have the coin & the business acumen. Private interests move in on the rights to own access to water. "This Little River Went To Market"
hears out a handful of people who look at such a scenario on small Waiheke Island, in New Zealand. They relate their local story to the fight for water rights globally.